The Hottest Four Hours I Ever Went Through, by FLOYD GIBBONS 145 the hole where the bullet had entered. Neither was there any sudden flow of blood. At the time there was no stiffness or discomfort in the arm and I continued to use it to work my way forward. Then the second one hit. It nicked the top of my left shoulder. And again came the burning sensation, only this time the area affected seemed larger. Hitting, as it did, in the meaty cap of the shoulder, I feared that there would be no further use for the arm until it had received attention, but again I was surprised when I found upon experiment that I could still use it. So I continued to move toward the major. Occasionally I would shout something to him, although at this time I am unable to remember what it was. I only wanted to let him know I was coming. And then the third one struck me. In order to keep as close to the ground as possible, I had swung my chin to the right so that I was pushing forward with my left cheek flat against the ground, and in order to accommodate this position of the head I had moved my steel helmet over so that it covered part of my face on the right. Then there came a crash. It sounded to me as if someone had dropped a glass bottle into a porcelain bathtub. A barrel of whitewash tipped over and it seemed that everything in the world turned white. That was the sensation. I have heard that when one receives a blow in the head everything turns black; but in my case everything became pre white. I remember this distinctly, because my years of newspaper training had been in but one direction-to sense and remember. So it was that, even without knowing it, I was making mental notes on every impression my senses registered. I DID not know yet where I had been hot or what the bullet had done. I knew that I was still knowing things. I did not know whether I was alive or dead, but I did know that my mind was still taking notes on every second. The first recess in that note-taking came when I asked myself the following question: "Am I dead?" I didn't laugh or didn't even smile when I asked myself the question without putting it in words. I wanted to know. And wanting to know, I undertook to find out. I am not aware now that there was any appreciable passage of time during this mental progress. I feel certain, however, that I never lost consciousness. How was I to find out if I was dead? The shock had lifted my head off the ground, but I had immediately replaced it as close to the soil as possible. My twice punctured left arm was lying alongside my body. I decided to try and move my fingers on my left hand. I did so and they moved. I next moved my left foot. Then I knew I was alive. I brought my right hand up toward my face and placed it to the left of my nose. My fingers rested on something soft and wet. I withdrew the hand and looked at it. It was covered with blood. As I looked at it I was not aware that my entire vision was confined to my right eye, although there was considerable pain in the entire left side of my face. This was sufficient to send me on another mental investigation. I closed my ADVERTISEMENT The World Is Now Being Revised Revision, Rehabilitation and Reconstruction are going forward in every Industrial, Professional, Social and POlitical field-in every Art and in every Science. The world has a new vision of Democracy. Thoughts that we thought up to mis summer of 1914 we can think no more. The very facts on which out thinking was based are altered. 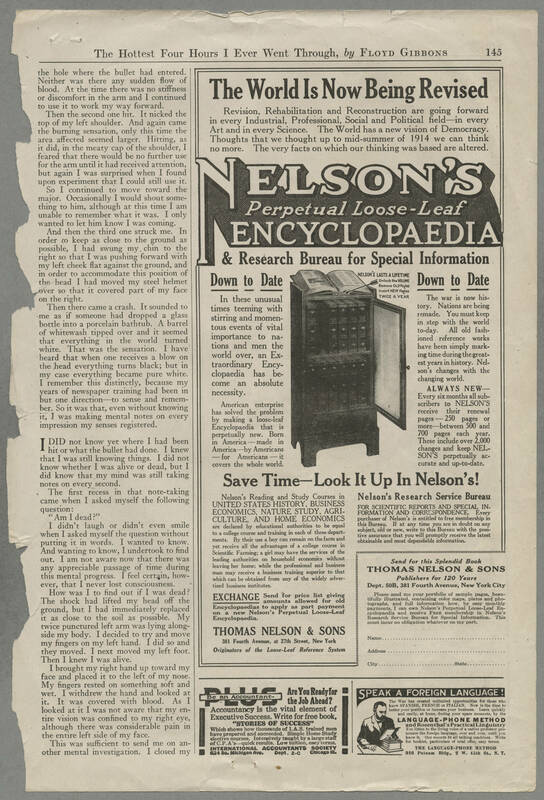 NELSON'S Perpetual Loose-Leaf ENCYCLOPAEDIA & Research Bureau for Special Information Down to Date In these unusual times teeming with stirring and momentous events of vital importance to nations and men the world over, an Extraordinary Encyclopaedia has become an absolute necessity. American enterprise has solved the problem by making a loose-leaf Encyclopaedia that is perpetually new. Born in America-made in America-by Americans-for Americans-it covers the whole world. Down to Date The war is now history. Nations are being remade. You must keep in step with the world to-day. All old fashioned reference works have been simply marking time during the greatest years in history. Nelson's changes with the changing world. ALWAYS NEW- Every sic months all subscribers to NELSON's receive their renewal pages-250 pages or more-between 500 and 700 pages each year. These include over 2,000 changes and keep NELSON'S perpetually accurate and up-to-date. Save Time-Look It Up In Nelson's! Nelson's Reading and Study Courses in UNITED STATES HISTORY, BUSINESS ECONOMICS, NATURE STUDY, AGRICULTURE, AND HOME ECONOMICS are declared by educational authorities to be equal to a college course and training in each of these departments. By their use a boy can remain on the farm and yet receive all the advantages of a college course in Scientific Farming; a girl amy have the services of the leading authorities on household economics without leaving her home; while the professional and business man may receive a business training superior to that which can be obtained from any of the widely advertised business institutes. EXCHANGE Send for price list giving Encyclopaedias to apply as part payment on a new Nelson's Perpetual Loose-Leaf Encyclopaedia. Nelson's Research Service Bureau FOR SCIENTIFIC REPORTS AND SPECIAL INFORMATION AND CORRESPONDENCE. Every purchaser of Nelson's is entitled to free membership in this Bureau. If at any time you are in doubt on any subject, old or new, write to this Bureau with the positive assurance that you will promptly receive the latest obtainable and most dependable information. THOMAS NELSON & SONS 381 Fourth Avenue, at 27th Street, New York Originators of the Loose-Leaf Reference System Send for this Splendid Book THOMAS NELSON & SONS Publishers for 120 Years Dept, 50B, 381 Fourth Avenue, New York City Please send my your portfolio of sample pages, beautifully illustrated, containing color maps, plates and photographs, and full information how, by easy monthly payments, I can own Nelson's Perpetual Loose-Leaf Encyclopaedia and receive FREE membership in Nelson's Research Service Bureau for Special Information. This must incur no obligation whatever on my part. PLUS Be an Accountant- Are You Ready for the Job Ahead? Accountancy is the vital element of Executive Success. Write for free book, "STORIES OF SUCCESS" Which shows how thousands of I.A.S. trained men have prepared and succeeded. SImple Home Study elective courses. Intensively taught by a large staff of C. P. A's-quick results. Low tuition, easy terms. INTERNATIONAL ACCOUNTANTS SOCIETY 624 So. Michigan Ave. Dept. 2-C Chicago Ill. SPEAK A FOREIGN LANGUAGE! The War has created unlimited opportunities for those who know SPANISH, FRENCH, or ITALIAN. Now is the time to better your position or increase your business. Learn quickly and easily, at home, during your spare moments, by the LANGUAGE-PHONE METHOD and Rosenthal's Practical Linguistry You lisen to the living voice of a native professor pronounce the foreign language, over and over, until you know it. Our records fit all talking machines. Write for booklet, particulars of trial offer, easy terms. THE LANGUAGE-PHONE METHOD 916 Putnam Bldg., 2 W. 45th St., N. Y.